صفر, محمود, احمدی گیوی, فرهنگ, محب الحجه, علیرضا. (1391). بررسی اثر ‌‌گوارد داده‌‌های رادار در مدل عددی ARPS در شبیه‌سازی بارش حاصل از سامانة همدیدی 31 مارس 2009 در منطقه تهران. 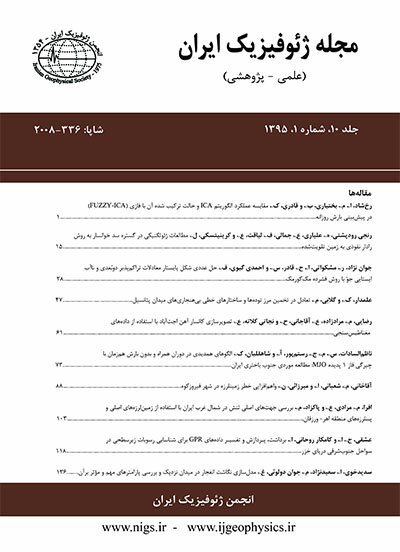 مجله ژئوفیزیک ایران, 6(3), 94-112. محمود صفر; فرهنگ احمدی گیوی; علیرضا محب الحجه. "بررسی اثر ‌‌گوارد داده‌‌های رادار در مدل عددی ARPS در شبیه‌سازی بارش حاصل از سامانة همدیدی 31 مارس 2009 در منطقه تهران". مجله ژئوفیزیک ایران, 6, 3, 1391, 94-112. صفر, محمود, احمدی گیوی, فرهنگ, محب الحجه, علیرضا. (1391). 'بررسی اثر ‌‌گوارد داده‌‌های رادار در مدل عددی ARPS در شبیه‌سازی بارش حاصل از سامانة همدیدی 31 مارس 2009 در منطقه تهران', مجله ژئوفیزیک ایران, 6(3), pp. 94-112. صفر, محمود, احمدی گیوی, فرهنگ, محب الحجه, علیرضا. بررسی اثر ‌‌گوارد داده‌‌های رادار در مدل عددی ARPS در شبیه‌سازی بارش حاصل از سامانة همدیدی 31 مارس 2009 در منطقه تهران. مجله ژئوفیزیک ایران, 1391; 6(3): 94-112. استفاده از داده‌‌های راداری در تشخیص پدیده‌‌های جوّی با کیفیت زمانی و مکانی مناسب یکی از روش‌‌های تصحیح پیش‌‌بینی عددی کمیت‌‌های جوّی است. در این پژوهش با استفاده از سامانه داده‌‌گواری مدل عددی ARPS تاثیر داده‌‌های راداری بر پیش‌‌بینی میان‌‌مدت میزان بارش در منطقه تهران و قم مورد بررسی قرار می‌‌گیرد. سامانه همدیدی مورد‌نظر که در روز 31 مارس 2009 مناطق مرکزی و جنوبی کشور را تحت تاثیر قرار داد، ناشی از کم‌‌فشار سودانی همراه با اثر شدید پُرفشار سیبری بود که موجب بارش قابل‌‌توجه در این مناطق از کشور و کمینه بارش در جنوب البرز شرقی شد. نتایج نشان‏دهنده تاثیر داده‌‌های رادار در طول زمان اجرای مدل است، ولی تاثیر این داده‏ها در زمان‏های پایانی اجرای مدل محسوس‏تر است. این بدان علت است که آخرین بخش داده‏های رادار در ساعت UTC 30 :10 وارد مدل شده است، در نتیجه تاثیر این داده‏ها بر نتایج خروجی مدل در بخش انتهایی بیشتر از ساعت‌های اولیه ورود داده‏های راداری است. Remote sensing is a maturing discipline that calls for a wide range of specialties and crosses boundaries between traditional scientific and technological disciplines. Its multidisciplinary nature requires its practitioner to have a good basic knowledge in many areas of science and requires interactions with researchers in a wide range of areas such as electromagnetic theory, spectroscopy, applied physics, geology, atmospheric sciences, agronomy, oceanography, plasma physics, electrical engineering, and optical engineering. The scattering of electromagnetic waves by precipitation particles and their propagation through precipitation media are of fundamental importance in understanding the signal returns from dual-polarized, Doppler weather radars. The main advantage of using radars for precipitation estimation is that they can provide measurements over large areas (about 10 000 km2) with fairly high temporal and spatial resolutions. Installing just one guage for each radar spatial sample (150 m resolution in range and one-degree resolution in azimuth) would require more than one-quarter of a million guages over a 150-km radius. These measurements are sent to a central location at the speed of light by “natural” networks. In addition, radars can provide fairly rapid updates of the three-dimensional structure of precipitation. The use of the radar data to detect atmospheric phenomena with suitable spatial and temporal resolutions has become one of the main methods to improve the performance of numerical weather prediction models. The effects of assimilating radar data to the ARPS numerical model on short time rain forecasts were investigated for a region covering parts of Tehran and Qom Provinces. The investigation was carried out for a synoptic system that affected the central and southern regions of Iran on March 31, 2009. The result of the juxtaposition of a Sudanese low and a strong Siberian high, the synoptic system led to remarkable rainfall in the main parts of the region of interest while leaving the southern flanks of Eastern Alborz with little rain. The ARPS numerical model was ran in two different ways: first, with the GFS (Global Forecast System) data in 3-hour time intervals; second, using the same GFS data together with the assimilation of the data of Tehran''s meteorological radar. The results of the latter two applications were compared with the actual observed rainfall accumulated over 6-hour and 24-hour intervals on March 31, 2009. The results demonstrated the usefulness of assimilating radar data to improve the rainfall forecast, both quantitatively and qualitatively. The effects of the radar data are felt more strongly at the final hours of the model run. This is due to the fact that the last part of the radar data was assimilated to the model at 10:30 UTC. The usefulness of the radar data assimilation is less felt in the high-altitude parts where the rain forecast critically depends on the particular cloud and the scheme used in convection parameterization. For the same reason, the rainfall forecast error is usually larger in the high-altitude parts of the region. بیدختی، ع.، مرادی، م.، آزادی، م. و مشکواتی، ا.، 1386، شبیه‌سازی عددی نقش کوهستان در یک سامانه بارش‌‌زا روی ایران: مجله فیزیک زمین و فضا، 4(1)، 25-44. مزرعه فراهانی، م.، وظیفه، ا. و آزادی، م.، 1388، بررسی اثر تفکیک افقی میان‌مقیاس MM5 در شبیه‌سازی بارش حاصل از سامانه همدیدی اکتبر 2004 روی ایران: مجله فیزیک زمین و فضا، 25(4)، 146-131. Biggerstaff, M., Listemaa, A., 1999, An improved scheme for convective/stratiform echo classification using radar reflectivity: J. Appl. Meteorol., 34, 2129-2162. Sugimoto, S., Crook, N. A., Sun J., Xiao, Q., and Barker, D., 2009, An examination of WRF 3DVAR Radar data assimilation on its capability in retrieving unobserved variables and forecasting precipitation through Observing System Simulation Experiments: Mon. Wea. Rev., 137, 4011-24029. Rosenfeld, D., and Amitai, E., 1992, Classification of rain regimes by the three-dimensional properties of reflectivity fields: J. Appl. Meteorol., 34, 198-219. Stainer, M., and Houze, R., 1994, Climatological characterization of three-dimensional storm structure from operational radar and raing gauge data: J. Appl. Meteorol., 34, 1978-2006. Xiao, Q., Kuo, Y., Sun, J., and Lee, W., 2004, Assimilation of Doppler Radar Observations with a Regional 3DVAR System: Impact of Doppler velocities on forecasts of a heavy rainfall case: J. Appl. Meteorol., 44, 768-788. Xiao, Q., Kuo, Y., Sun, J., Lee, W., and Barker, D., 2006, An approach of Radar reflectivity data assimilation and its assessment with the Inland QPF of Typhoon Rusa (2002) at Landfall: J. Appl. Meteorol., 46, 14-22. Xue, M., Droegemeier, K. K., Wong, V., Shapiro, A., Brewster, K., Carr, F., Weber, D., Liu, Y., and Wang, D. H., 2001, The Advanced Regional Prediction System (ARPS) - A multiscale nonhydrostatic atmospheric simulation and prediction tool. Part II: Model physics and applications. Meteor. Atmos. Physics., 76, 134-165. Xue, M., Wang, D.-H., Gao, J.-D., Brewster, K. and Droegemeier, K. K.,2003, The Advanced Regional Prediction System (ARPS), storm-scale numerical weather prediction and data assimilation: Meteor. Atmos. Physics, 82, 139-170. Xue. M., Droegemeier, K. K., and Wong, V., 1995, Advanced Regional Prediction System (ARPS) and real-time storm prediction, Preprint, International workshop on limited-area and variable resolution models. Beijing , China , 23-27 Oct. 1995.